diesel pollution abound. That’s the central message of a new report released by the Pacific Institute of Oakland, California, the West Oakland Environmental Indicators Project (WOEIP), and the Coalition for West Oakland Revitalization (CWOR). 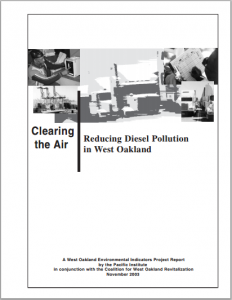 Clearing the Air: Reducing Diesel Pollution in West Oakland, which builds on community ideas and employed residents to conduct on-the-ground research, also looks at innovative ways to reduce truck traffic and pollution in residential areas, and improve community health. The report, guided by the community-run WOEIP committee and employing local residents to count trucks, recommends a host of solutions to the problems of diesel pollution and truck traffic. These include stepped up enforcement of illegal truck traffic, moving truck-related businesses away from residential areas and out onto land owned by the Port and Army Base, the installation of electrical hook-ups so trucks waiting to enter the Port don’t have to idle, financial incentives to get the dirtiest trucks off the road, and the creation of new truck routes with signs and other outreach to ensure that drivers know the right route.